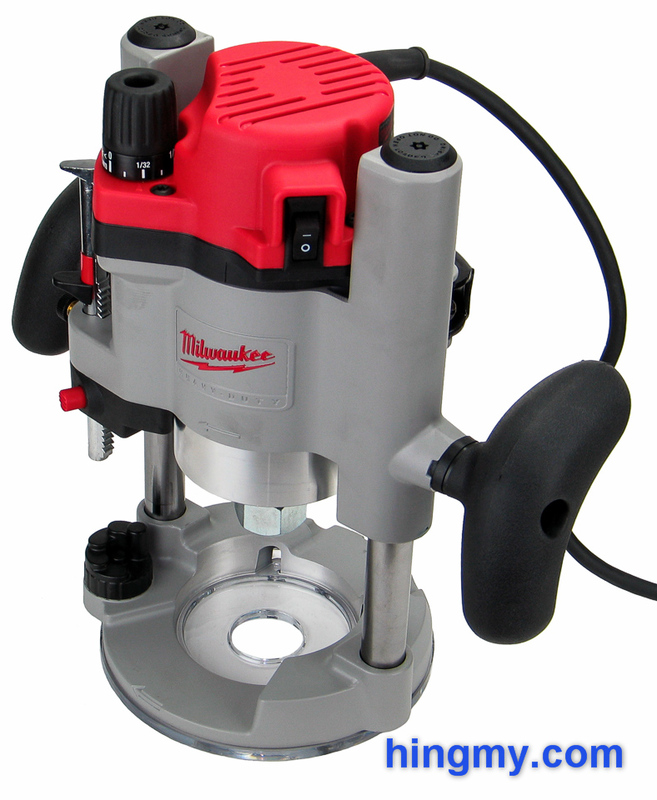 The second part of our Milwaukee 5615 router review concentrates on the plunge base. Like the fixed base we tested last week, the plunge base is heavy and very well built. The same innovative depth adjustment feature that caused some stirs in the fixed base review makes an appearance. So far so good. Lets take a look at what we will find upon closer inspection, shall we? The fixed base is part of all kit versions of the 5615. We tested it as part of the 5615-20 Router Review. It manages to impress with its very sturdy construction. The BodyGrip pad that wraps the body of the router gives the user an alternative hand position. Due to the router's weight a second hand on one of the handles is still necessary. The base's primary weakness lies in its high center of gravity. Even with the router motor lowered for a deep cut, the router feels very tippy. The full review contains more details. The plunge base follows the same design guidelines that define the fixed base. There's a lot of metal, and very little plastic. The motor mount, in particular, is well thought out. Unlike most plunge bases, which use the split base design to hold the motor in place, the base of the 5615-24 is cast as a solid piece. Only the motor clamp moves when the motor latch is closed. The motor and any other components of the system retain their alignment. The plunge lock lever is easily the worst part of the plunge base. The spring that returns the lever to its default, locked position is far too strong. It takes most of the strength in your thumb to unlock and hold the lever in its open position. Most females will not be strong enough to move the lever at all. After only a few plunges your thumb will start to hurt. On the positive side all that force keeps the router locked down when you want it to be. The spring will soften somewhat over time, but Milwaukee is so far off from where it should be that it is hard to come up with excuses for the company. The plunge action itself feels very controlled, if you ignore the issues the plunge lever is causing. A couple of springs, one encased in each tower, provide gentle, but steady resistance during the plunge. Smooth plunge strokes are very much within reach. The ergonomically shaped handles are an interesting and welcome alternative to the common knob style handles. Shaped like a banana, the handles lie comfortably with the palm of each hand. Their rough, rubbery texture keeps your hands where they belong and the router under control. Being directional the design puts the plunge lock on your left thumb. The dust collection shroud, however, can be installed on both sides. The clear plastic sub base comes pre-grooved for installation of guide bushings. 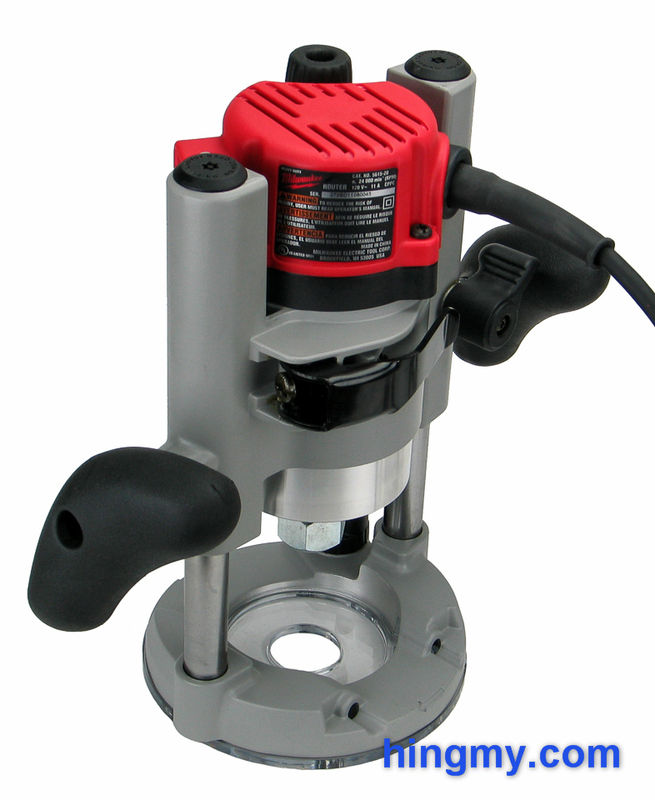 The kit does not include a large opening sub base, which limits the router bits that can be installed in this tool. Following the traditional design there are two channels for installation of guide rods. The depth adjustment mechanism works like no other. The tradition depth stop turret and rod are there, but they work slightly different than they do on a standard design. The knob at the top of the router actually moves the rod up and down. Using the scale the operator can dial in any distance within the full plunge range without having to use a different measuring device. If you want to make even finer adjustments, the scale built into the bottom of the depth adjustment knob is accurate down to 1/256th of an inch. A set screw locks the rod in place for the cut. Unfortunately a couple of issues mar the performance of this amazingly well designed system. There is ~1/8" of play in the depth adjustment mechanism when the rod is not locked down. The rod can be pushed up with just the pressure of a finger. If you erroneously lock the rod down when the rod is being held up by the turret, it'll drop as much as 1/8 of an inch as soon as the lock is released. This ruins any measurements you have made on the scale. The other issue is one Milwaukee could have easily avoided. The movable marker that indicates the position on the scale cannot be positioned at absolute zero. In its lowest position the marker sits just barely above the zero line. The operator must compensate for this by moving the marker slightly beyond his or her target on the scale. The six position turret at the bottom of the router works like it does on other routers. All six steps are spaced 1/8th of an inch apart. There is no adjustable depth stop. All of this leaves us with a sour taste. The issues of the depth adjustment feature are such that the user has to be aware of them to achieve consistent results. A truly great tool keeps you from making mistakes and helps you find the correct setting. Off course the 5615-24's depth adjustment mechanism can be used like that on any other router without running into issues, but we can't help but wonder that Milwaukee squandered an opportunity here. The motor itself is defined by its rugged simplicity. The single speed, 11 amp unit is well matched with the size of the router and its most likely uses. 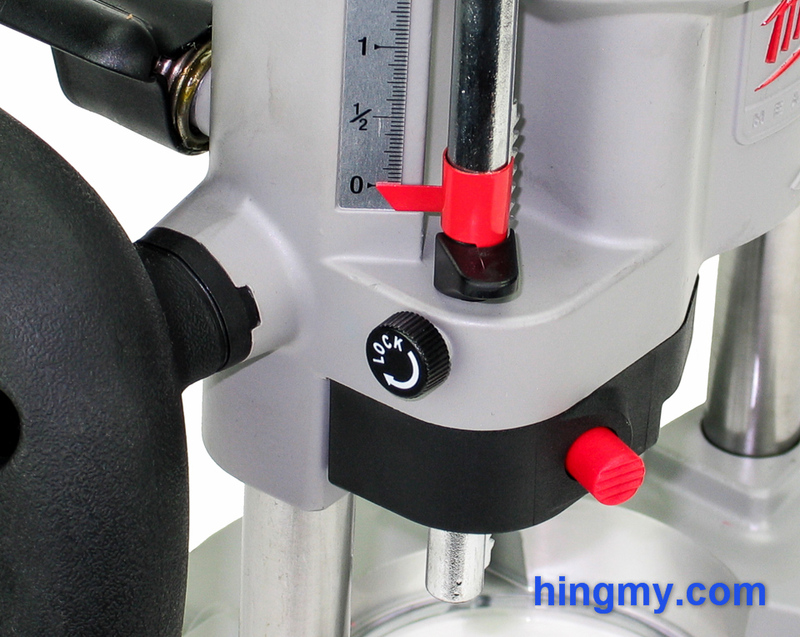 The integrated depth adjustment knob and screw blend into the body of the motor. Unless you mishandle the motor, the unit and its attachments will perform for years in a commercial environment. The missing soft start on the motor has been an issue in the fixed base, and it remains one here. It is practically impossible to keep this router in place when the power is turned on. Whatever undesired movement there is will be small, but there will be some. For truly fine woodworking this can be challenge. The large collet nuts do not get in the way as much on the wide open plunge base as they do on the fixed base. Besides being a curiosity, the large nuts make for very fast and easy bit changes using the two wrenches included in the kit. To simplify the process, both wrenches are the same size. 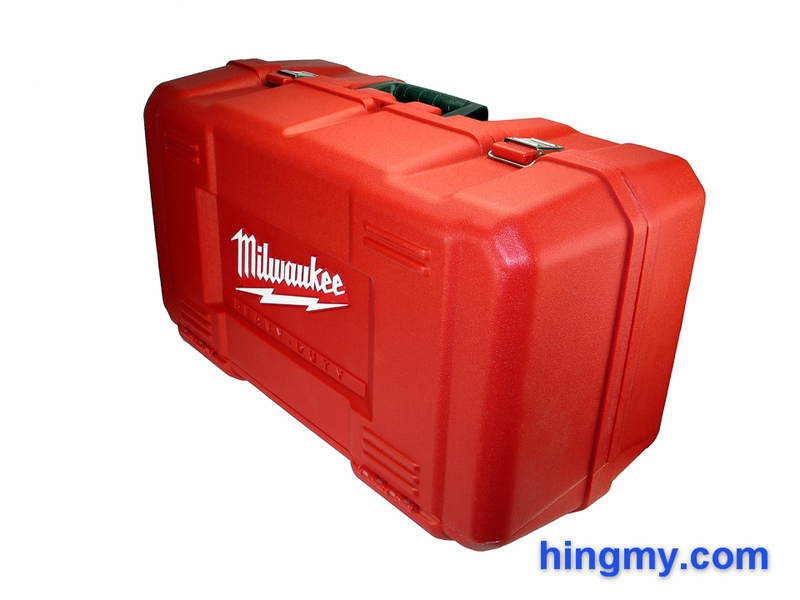 Milwaukee is trying to differentiate their routers by including a very sturdy, innovative case in all but the baseline kit. The double wall case is made from vacuum formed plastic. It won't break or dent on the job site unless you are trying to destroy it. The walls of the case are lined with recesses for all the accessories that come with the router. There is even room for a couple of dozen router bits. Overall the case keeps your router and every accessory you want to bring to the job site out of harms way. The case opens like a clam shell to give the owner easy access to the router. Milwaukee calls this feature the RouterStation. The case is the place you put your router down after you have used it. If you really want to let a large case take up counter top space in the shop, is up to you. Dust collection performance follows the default story template for plunge routers perfectly. Without a dust hose attached there simply is no dust management. The motor blows chips all over the work area. With the dust shroud attached dust collection above the bit improves, but does not reach the performance of most competitors. The dust shroud's limited height does not leave enough room for the collector to catch all dust particles. Some dust escape through the hole in the top of the shroud. Other routers do much better here. The lack of holes in the sub base severely limit dust collection below the base plate. The dust collector does round up some dust through the primary hole in the base plate, but its far from everything and much less than what other routers mange to collect. The shared motor makes the plunge base perform nearly identical to the fixed base. The motor is more than capable of driving any bit that fits into the base through any material you can throw at it. Being built for the job site the components of the 5615-24 kit have a high duty cycle. This router can go all day, and it will last for years. Issues start popping up when the plunge mechanism is used during a cut. The stiff plunge lock lever takes so much force to operate, that it is hard to keep the router in place. The user can't help but worry about the router moving a little. That's not an emotion one should feel when using a good tool. Add to that the pain you will feel in your thumb and you'll understand why one would want to put the 5615 away and finish up with another tool. The 5615-24 looks like a good kit on paper and it is well built to boot. All that does not matter, if it cannot be used for what is was purchased for. Milwaukee sells two lines of BodyGrip Routers. The lesser one, the 5615 series, includes an 11 amp, fixed speed motor. The premier line, the 5616 series, includes a 13 amp, variable speed unit. The different bases and accessories are shared between the two series. 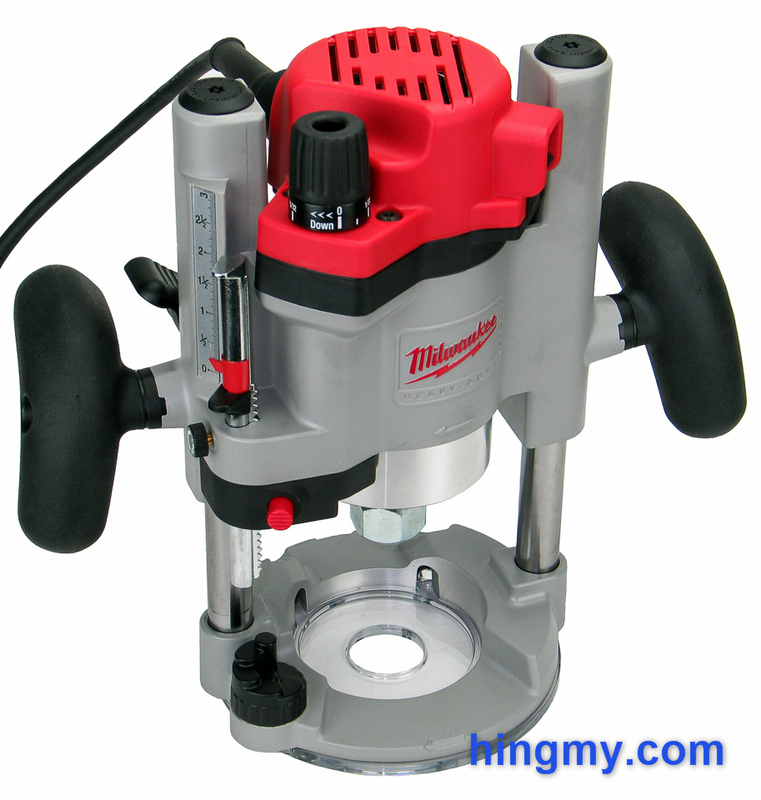 The variable speed motor of the 5616 series make it the better choice for fine woodworking. The 5615-24 is a tough router kit that puts up good performance numbers. Both bases and the motor are built extremely well. There are only a few cuts the motor cannot handle. The fixed base is more top heavy and tippy than the competition. The plunge base sports great handles and an innovative depth stop system that both changes the way woodworkers think about setting the depth of a router, and manages to be just unreliable enough to introduce errors into your work. The stiff plunge lock lever on the plunge base is a glaring error that is hard to overlook. It negatively impacts the performance of the plunge base so much that we cannot recommend the 5615-24, and by association the 5616-24, as a sure buy. That's a shame considering how many things the 5615-24 brings to the table. Do not buy this kit sight unseen. You should test drive it before you buy it.